IMPORTANT: Make sure to save the form on you computer and then fill it out and print. Reserve Early: It is recommended that you reserve your hotel room as soon as the conference/meeting is established. Use your Own Card: You should use your credit card to first reserve the room. Why? Because you cannot use the CalCard when the trip is not fully approved, and you may lose that conference room rate. Also, you are just reserving and not paying at this time. You can easily cancel if do you receive approval or if you decide not to attend. Ask for a Hotel Advance: What works very well is to have an advance send to you (by checking the "Accounting to return Hotel Advance to Traveler"). That way you can pay your credit card within the month and forget about those pesky interest charges. 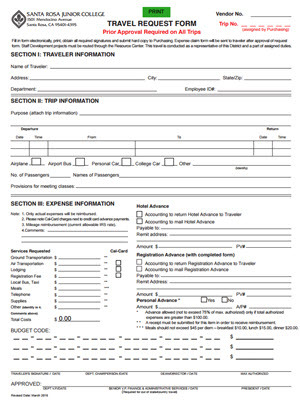 Hotel Confirmation: You will need to submit this along with your original Travel Request packet. Register Early: You can sign up for your meeting or conference even before you submit your Travel Request. 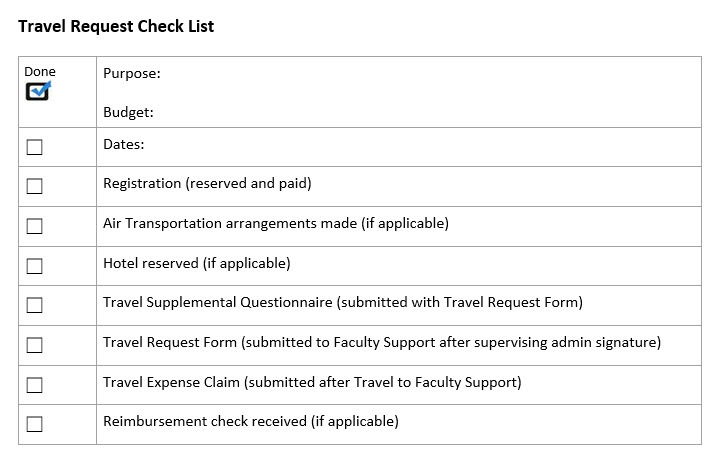 Registration Confirmation: You will need to submit this along with your original Travel Request packet.